Review posted August 23, 2011. 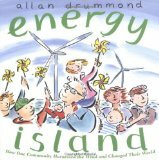 Energy Island is a nonfiction picture book about an island in Denmark that uses only renewable energy generated on the island. The island is very windy, so wind power is a major source of energy on the island, and you can see the effects of the wind in all the illustrations and the repeated cry of "Hold on to your hats!" This isn't necessarily a book for school projects, so I hope that it doesn't get buried in the nonfiction section. I hope children find it, because it tells a beautiful, inspiring -- and true -- story.